Looking to learn more about Hearthstone's sixth expansion? Visit our adventure guide for Knights of the Frozen Throne!! It's will be only good if rogue got a lifesteal weapon to support a more slower deck. Because on normal decks SI agent will be better. Obviously great arena card for rogue. Definitely increases going first advantage. This is a potential board clear for Rogue. One spell on a Wild Pyromancer kills the board. This could combo well with the Jade Swarmer if Jade Rogue ever makes it to be a good deck, or Swashburglar. Too bad Rogue does not generate tokens easily. Another good card for Arena, but bad in constructed. Ok, FINE, I'll just never ever play a big minion against Rogue in arena. Plaque Scientist, eh? I always thought Rogue's dentistry needed work. You seen those pirates? Edit: Ah, bugger, they fixed it. This would have been badly needed in zoo warlock. Great arena card, but vastly outclassed by Vineslayer. on the other hand, this has added surprise factor since the opponent will not know the minion where this battle cry will target. This will force the opponent to make sure that the rogue's board is completely clear, otherwise, any live minion can be made poisonous. 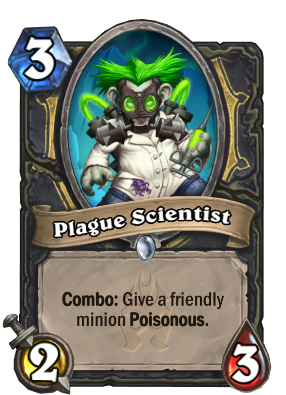 in constructed we have envenom weapon with same effect and wont see play,or maybe stealth rogue will be a thing ? This seems really good for a common. It's the Gastropod effect all over again; guarantees that any friendly minion in play, no matter how small, gets to trade up, which is stupid powerful in Arena. Compared to SI:7, this has much worse stats on curve and requires a minion in play that can attack, but the upside of killing anything no matter the size is huge. Compared to Vilespine Slayer, again this requires a minion in play and it doesn't bypass Taunts but is way cheaper which matters since it's a Combo card. Compared to Envenom Weapon, this allows you to have a similar effect at Common, with a body attached, and you don't have to facetank the damage, but you need to have some board presence already and most likely only lasts once (unlike the two Charges your Envenomed weapon provides). And let's not even get into the potential synergies this has with anything that deals damage. Knife Juggler becomes a sniper rifle, and Wild Pyromancer becomes a nuke. In my eyes it's limitations only make it that much more interesting as a card. Fantastic common.